IIT Delhi’s Cultural Fest, Rendezvous 2016, took off on 21st October,2016. The day opened with the immensely energetic street play acts by the dramatics societies of various college like IIT-Delhi, Hansraj College and Kirori Mal College. 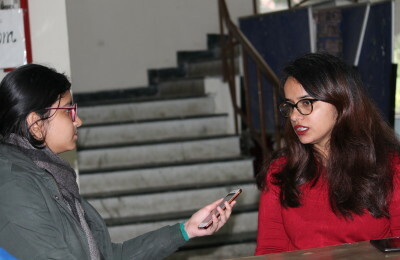 The fest also hosted one its most awaited events on Day 1 which was the Campus Princess. Another much anticipated event of the fest, Mr. & Ms. Rendezvous 2016, saw huge participation from across Delhi. The finale round of the event consisted of two stage rounds. The judges then presented the prestigious title of Mr. Rendezvous to Monis Ahmad Khan of Jamia Milia Islamia University, and Ms. Rendezvous to Sanya Devgon. Blitzkreig- the battle of bands, added to the energy of the day . Bands like High Frequency, Knight Shades, The Forbidden Ritual and many more gave power- packed performances. The first prize was bagged by Knight Shades and the second by the band High Time. The first pro night of IIT Delhi featured Drowning Pool, an international rock band, that gave their first performance in India, and brought the first day to a close. The second day kicked off with Tatva, the fusion band competition. The event witnessed participation from various colleges across the country. Infusion band of IIT Delhi stood first, while Chaos Theory of Shiv Nadar University came second. Twelve Strings of Vivekananda Institute of Professional Studies (VIPS) bagged the third position. Mimansa, the street play competition was held simultaneously, where teams depicted various issues like the caste system and religion wars. The first prize was won by Ankahi – the dramatics society of IIT Delhi, while Anubhuti – the dramatics society of Janki Devi Memorial College (JDMC), and Ijaad – the dramatics society of PGDAV College (Evening) came second and third, respectively. The day continued with several informal and competitive events like Voice of Rendezvous, Story Teller, Paintara, Scooter Stunts and Chakravyuh among others. It was followed by the event YouTubers United, where series of events celebrating the rise of these new celebrities took place. Its second series witnessed various pranksters like Rishabh Rai, The Teen Trolls, Love Rudrakash, The TroubleSeekingTeam and The AVRprankTV. The day concluded with Euphoria Band, energetically performing its various popular numbers. Day 3 will witness final rounds of various competitive events like Electronica and Western Group Dance. Stay tuned for all the updates!